When it comes to my purse, I struggle with wanting to be prepared for anything and wanting to pack as light as possible. On most days, I carry a small, cross-body bag so that I’m hands-free. To me, having nothing on my shoulders or arms is so much more comfortable, and makes me more productive and active!. The downside of not carrying a larger bag or tote is that I don’t have a ton of room to carry “just in case items.” I strategically try to pack only the essentials in my daily purse, but the truth is that I want more than just my keys, wallet and phone. So I’ve gone on a bit of a hunt for products that are helpful in my quest for the perfectly packed purse. During my investigation, I’ve come across so many incredible ideas, I just had to share! Here are 7 power-packed products for keeping your purse (big or small) organized, space efficient and prepared for anything! If loose receipts and papers fun rampant in your purse, an accordion filer is the ticket to an neat purse. 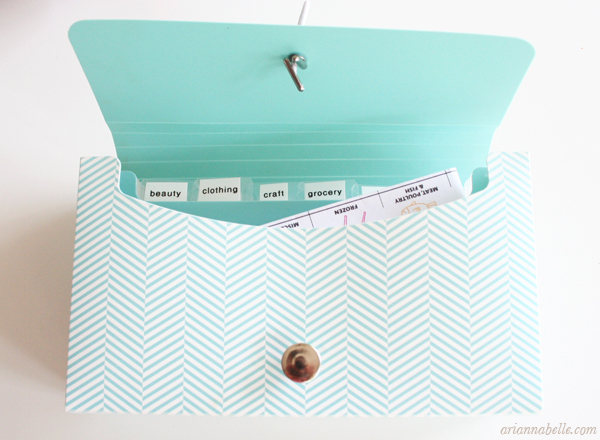 This is perfect for easily filing away receipts, coupons or paperwork on the go. Arianna of AriannaBelle.com uses this turquoise filer to keep her different coupons sorted, so checking out at the store is a breeze! That’s why having an itty-bitty pack of girly “emergency” items is such a brilliant problem solver. Admittedly, I throw my earphones in my purse half-hazardly when I’m on the go. The problem with this habit, is my earphones get lost in the bottom of my purse, and get damaged when I yank them out. I’ve broken so many of my earphones this way.